One of the best hamburgers in the greater New Orleans area is served at Joey’s Grill inside Jeanfreau’s Super Market in Chalmette. But the real allure of Jeanfreau is the handmade sausage that their charcutiere puts out on a daily basis. I go here for the pork sausage laced with green onion and anchored with plenty good hog fat. An hour on the smoker in the backyard and you have one of the premium forcemeats served in all of Louisiana. 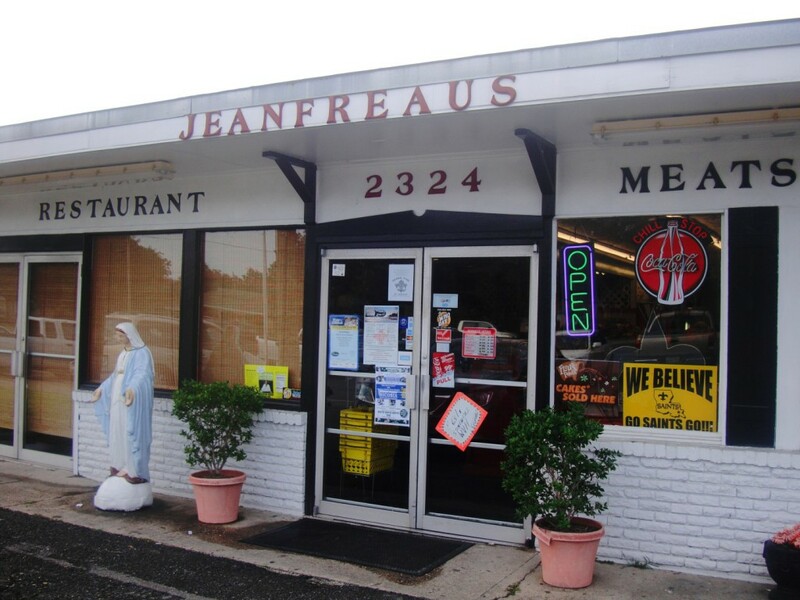 Jeanfreau’s has also been known to open their commercial kitchen to area culinary schools so that their students can get some hands on experience on the grinder/extruder. Who knows how many budding charcutieres have developed a love of the craft from this crucial experience? This entry was posted in Louisiana Daily Photo and tagged chalmette louisiana, jeanfreau super market, joey's grill, Louisiana Daily Photo. Bookmark the permalink.